In this post apolocalyptic fantasy, The United States has fallen and from the rubble rises Panem, a Capitol City controling 12 districts using fear tactics and control of food. Each year, two representatives from each district compete in a tournament to the death called The Hunger Games. When 16 year old Katniss's younger sister is selected, she goes in her place. She must battle the other contestants for her life if she ever wants to return home again. Engrossing, brutal, and strangley realistic at times, this book kept me reading to the last page. The violence surpried me, this is not a book for the faint hearted. Yes, contestants die brutal deaths. Underneath all the violence and desperation is a mysterious love story where you don't know if either one's affections are real, or part of the game. The characters are interestingly three dimenisonal, with some being not good or bad, but falling inbetween. Katniss doesn't know who to trust, or who will stab her in the back. I'm looking forward to reading the next book in the series, as well as watching the movie! Great review, Aubrie! 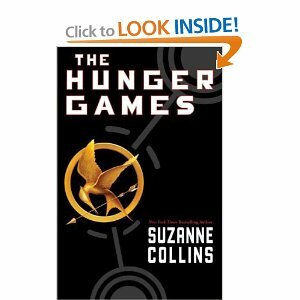 I've read a little bit of this book with my Kindle app for my phone. It's been good so far, but I hope to sit down and read the rest soon. I really loved The Hunger Games, but the next two books in the series were a little bit a letdown. But there's no way to stop after the first book. The story is addictive! I've heard of this, too. It's weird. I can read brutal scenes, but have a hard time watching them on TV or movies. I might give this book a read.